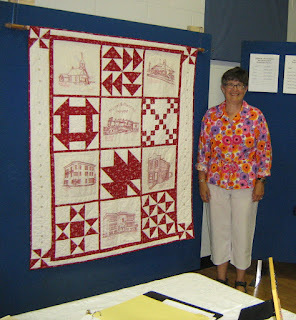 Margaret Blank: Thoughts from a Textile Artist: Let the Celebration Begin! Camper-trailers and fifth wheels have been pulling in through town since early this morning. There are more vehicles parked along Main Street than I've ever seen in the almost-four-years since I moved here. People are meeting and greeting and clustering in little clumps on the street corners, catching up -- be it weeks, months, years or decades since they've seen each other. Some are strolling along the street, reading the captions and histories posted in the storefronts, telling what used to be there and when. This was taken with my camera by Kathy, wife of the Chair of the Museum Board, after she took another couple with her own (more sophisticated) camera for the Museum's records. Memories of Mirror will be on display behind the Registration/Check-in table today through 9 p.m. and again tomorrow 10 a.m.- 5 p.m., after which it will go into the Museum's permanent collection. I gotta admit, I'm one proud mama! It's lovely to stand by quietly and hear what people have to say about it -- the women in particular are drawn to it, and cell phones are being taken out to photograph it. I say nothing, just drink it all in. The encouragement will keep me creative for a good long time, fending off The Voices that haunt me (as all artists) at any time, day or night. Could be a rose, eh? Enjoy, Margaret! The quilt looks wonderful! 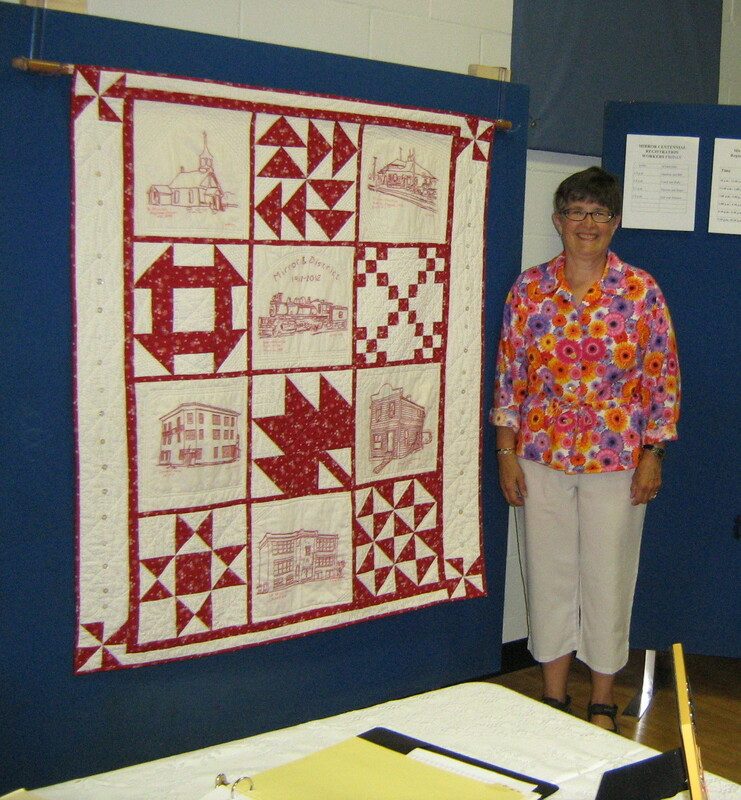 Enjoy the celebration-your quilt looks wonderful!